This is an elegant and easy dessert inspired by the French. It consists of delicate poached French meringues floating on a pool of custard sauce call Crème Anglaise. 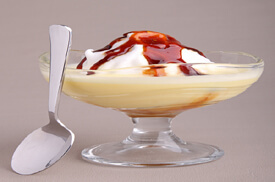 You will be making caramel sauce from starch to go with this dessert.